A ball can start a revolution. Born in Kabul, Awista Ayub escaped with her family to Connecticut in 1981, when she was two years old, but her connection to her heritage remained strong. An athlete her whole life, she was inspired to start the Afghan Youth Sports Exchange after September 11, 2001, as a way of uniting girls of Afghanistan and giving them hope for their future. She chose soccer because little more than a ball and a field is needed to play; however, the courage it would take for girls in Afghanistan to do this would have to be tremendous--and the social change it could bring about by making a loud and clear statement for Afghan women was enough to convince Awista that it was possible, and even necessary. Under Taliban rule, girls in Afghanistan couldn't play outside of their homes, let alone participate in a sport on a team. So, Awista brought eight girls from Afghanistan to the United States for a soccer clinic, in the hope of not only teaching them the sport, but also instilling confidence and a belief in their self-worth. They returned to Afghanistan and spread their interest in playing soccer; when Awista traveled there to host another clinic, hundreds of girls turned out to participate--and the numbers of players and teams keep growing. What began with eight young women has now exploded into something of a phenomenon. Fifteen teams now compete in the Afghanistan Football Federation, with hundreds of girls participating. Against all odds and fear, these girls decided to come together and play a sport that has reintroduced the very traits that decades of war had cruelly stripped away from them--confidence and self-worth. 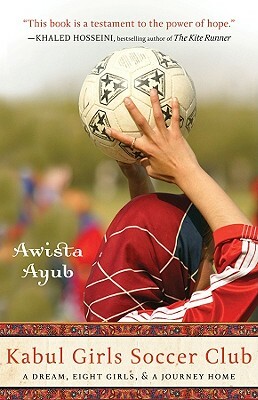 In However Tall the Mountain, Awista tells both her own story and the deeply moving stories of the eight original girls, describing their daily lives back in Afghanistan, and how they found strength in each other, in teamwork, and in themselves--taking impossible risks to obtain freedoms we take for granted. This is a story about hope, about what home is, and in the end, about determination. As the Afghan proverb says, However tall the mountain, there's always a road. Awista Ayub was born in Kabul, Afghanistan, and escaped with her family to Connecticut at 2 years old. Following 9/11, she founded the Afghan Youth Sports Exchange as a means of introducing soccer to the young women of Aghanistan, both on US and Afghan soil. Today, she serves as director of the AYSE and lives in Washington, DC.